I have just come back from my 2nd holiday of the year (I am a very fortunate girl this year). This holiday was different, as it was just The Curate, Little Bear and Myself. No extended family, not even the gorgeous and extremely lovable Monty the doodle. Little Bear was very well behaved and in control on the journey down to my mum's (from here on in known as Nanna) house. We had a lunch which Nanna had lovingly prepared, and LB went to check out his room, and make sure all the toys Nanna keeps there were present and correct. He came down and announced "Nanna's house will always be the same." which is Little Bear speak for "I feel safe and secure knowing that Nanna has these things she keeps for me." Over lunch, Little Bear quizzed Nanna on whether she was "lonely being here on your own?" Wise words from my almost 5 year old. He was over joyed when he asked whether Nanna missed Monty dog and she replied "I miss you!" though. We left Monty dog at Mums and went on our way to our holiday accommodation, a caravan, compact and bijoux on a Bunns Leisure holiday park. Now, I think holiday parks are extremely under-rated. The caravan was big enough for us 3 (although would have been tight with the maximum 6 plus luggage allowed). The children's funfair had well priced and sensible speed rides for a 'children's funfair'. The Go Karts were reasonably priced and entertaining - although much fun was had (by LB and I) watching the Curate try on every single helmet in the place before settling on one which fitted but left a red welt on his forehead after. The boys had a great time on crazy golf (Little Bear's favourite activity). It was worth the sheer hell of the noisy overcrowded changing rooms to see LBs smiling face beaming with enjoyment the whole time we were in the pool. We flew a kite on the beach and had a quiet afternoon of watching LB paddle in the sea. I have sung the praises of a park based caravan holiday so for balance some of the irksome bits. Little Bear hardly slept (usual on a first night on hols but lasted all week this time) the noise, the light evenings (which the holiday camp can't help with I know), and the narrow caravan bed, all resulted in seriously diminished sleep for LB. I slept fine, the Curate tells me nights were noisy! The holiday was fab! 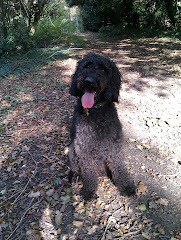 Good fun, just the three of us, and Nanna had Monty for company - everyone's a winner. 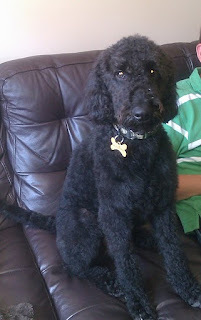 Although Monty may disagree, at 2 years old he had never had a professional groom - until Nanna got involved!! He looks even more gorgeous though! Sounds like a good holiday - Holiday parks and children are meant for each other. Our last family holiday, when our boys were in their teens, was in a park in Holland next to an amazing swimming pool with free entry for us all. Loads of rapids and whirlpools. A great success.